These three reports contain indexes to the grant books and original wills dealt with by the consistorial court of the Diocese of Dublin. Prior to 1858 responsibility for all testamentary matters was held by the established church (the Church of Ireland) and all wills, irrespective of the religion of the deceased, were proved or probated by the appropriate Diocesan consistorial court. Furthermore the consistorial court registered marriage licences/allegations and bonds, as well as other matters. The Diocese of Dublin is quite large and covers far more than the modern county of Dublin. It also includes most of County Wicklow, large parts of southern and eastern County Kildare, and smaller portions of Counties Carlow, Laois (Queen’s County) and Wexford. Consequently the Diocese’s Consistorial Court covers this expansive area too. The indexes presented here were published in two volumes of the Public Record Office of Ireland’s regular reports, as well as a portion of a third volume (vol. 31) given over the corrections and omissions in the pre-1800 material. These reports were published by the Deputy Keeper of the PROI and are full of extensive information about record transfers to the repository and catalogues of its holdings. Name: contains name, address and sometimes occupation of the person(s) named in the record. For a marriage the name of the bride and groom are given. Year: The year in which the record was registered with the Court. Nature of record: This is an acronym of the original record, e.g. ML=marriage licence ; W=will, etc. Page = this was the reference to the actual page number in the original grant books. But these were destroyed in the 1922 destruction of the PROI. Since the destruction of the PROI resulted in the loss of the vast majority of the original documents indexed here, this publication remains the only evidence that survives. 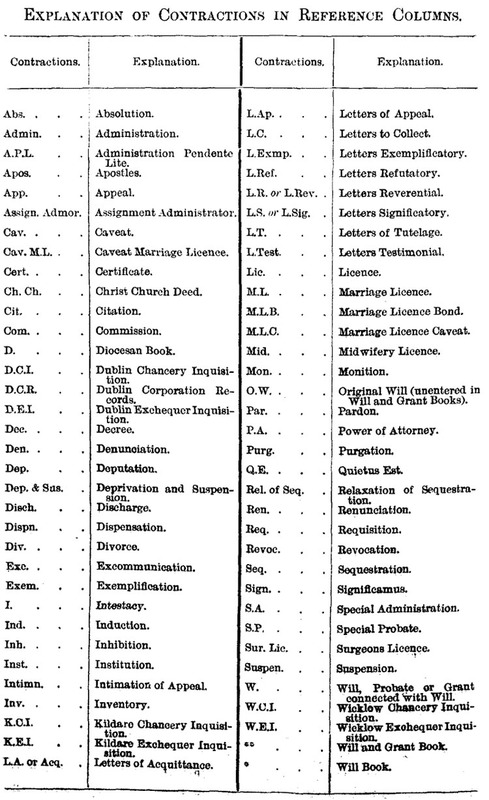 A full list of the acronyms used in the Deputy Keeper of Ireland, Index to the Act or Grant Books, and to Original Wills, of the Diocese of Dublin 1272-1858 (26th, 30th and 31st Reports, 1894, 1899).